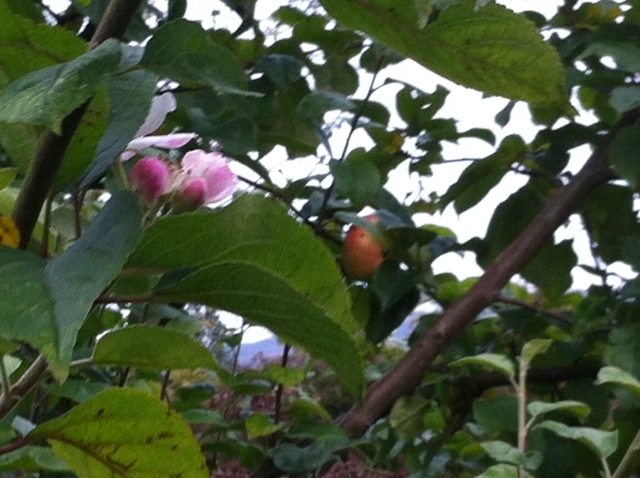 There are apple blossoms on three of our apple trees. All three of the trees have apples ripening on their branches. The same branches have both blossom and fruit. I feel confused looking at them. I feel disturbed looking at them. What will these trees be doing in the spring if they are in blossom in October? Jeri is making capes for his ducks. He has a few capes left over from last year but he now has more ducks than he had last year so he needs more capes. The ducks are white and the capes are black. Each cape has a ruffle at the neck and a bit of red edging on the top of the ruffle. The capes are held onto each duck with a little piece of velcro at the neck fastening. The ducks wear these capes for the evening of Jeri’s Halloween Scary Garden. They make little swooping flights from here to there. The whooshing of their wings and their capes both thrills and frightens the visiting children. The children race about with torches in the darkness screaming and finding sweets. Jeri’s ducks usually go to bed quite early but they stay up later than usual on Halloween. They seem to enjoy both their capes and the company. When the sugar bowl is empty or almost empty there is the feeling that you should wash it. There are always some clumpy bits of sugar at the bottom of the bowl. Someone has always dipped a wet spoon into the sugar bowl. There is sugar stuck to sugar and there is sugar stuck to the side of the sugar bowl. It might always be like this but it is more noticeable when the bowl is nearly empty. So the normal thing is to wash your sugar bowl so that you can start fresh with a clump-free offering of sugar. It is a known fact that if you wash your sugar bowl you will have visitors. A mean person is a stingy person. A mean person is tight. A mean person would not give you the steam off his porridge. I should know better than to drive down to the village anytime after five o’clock. There are bound to be cows on the road. There are three farms to pass. Sometimes everyone is moving their animals so I have to wait for first one herd and then another and then a third. They will be being driven back from some fields to the barn for milking. After that they will be on their way to another field. Some of the cattle are just being moved from field to field. It is a foolish time of day to be on the road. When the animals bar my way I have nothing to do but to turn off the engine and to wait while they amble towards me or away from me. Sometimes they jostle the car as they pass. It is a good idea to fold in the side mirror so that the weight of a cow swaying by does not snap it off. There is no way to hurry the movement of the group. Today as I waited I watched a cow jumping up on a gate in an attempt to get into a field where there was a bull. I have never seen a cow jumping at a gate to get out of a field so it is even more peculiar to see one jumping to get into a field. Yesterday we visited the newly built extension to the SuperValu in Cahir. It is not altogether complete but it is being shopped in as if it is complete. A lot of areas are empty where the shelves have not been moved into them yet. Other areas are crowded because there is such a large chaotic incomplete movement of boxes and products and shelving. Every single person in the shop looked confused. Nothing was where it used to be and some things were not anywhere to be seen at all. There was a man painting the outside doorways with bright red paint. Another man was sweeping up the area just outside the doors. His sweeping was sending great clouds of dust into the air. The man painting the doors did not take any notice of the dust flying and floating and landing on his fresh paintwork.